A museum-quality look at a price that is easy on your pocketbook. 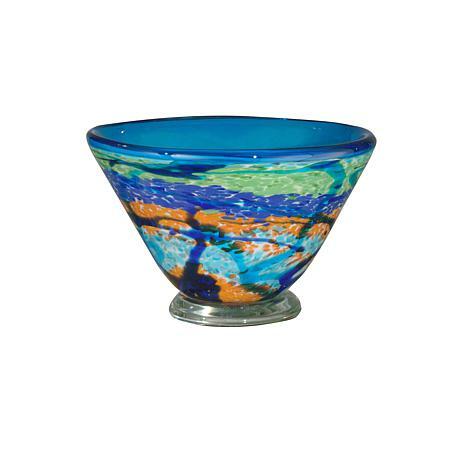 Henna features a bright wave of greens, pinks and blue, which flow around the outside of this nicely sized bowl. The interior wall is a lush shade of rich blue, which perfectly complements the colors outside. The bowl sets atop a clear glass round which showcases the color to perfection. I always read the reviews of an item before I buy. Most of them were good a couple had flaws but I wanted a nice gift for my mother. 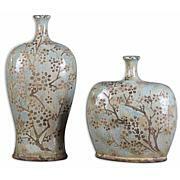 This vase is GORGEOUS!!! very nice quality, heavy and the colors are beautiful. I cant wait to see her reaction at Christmas!! I bought this beautiful piece as a gift. It was so pretty, an item that doesn't show itself as lovely as it is in this photo. It looks more like a bowl. It was the perfect gift. I would purchase it or another item from the collection in the future. The colors in the product are as lovely and bright as on the we-site picture. I was a little disappointed because the bowl did not sit evenly. You have to turn it around until it sit's flat. I have it with one side against a wall so you only see the front. One side of the bowl will always look crooked, but I am keeping it, it is beautiful ! !